Seventeen year old Marquese is what members of the juvenile justice system call a "frequent flyer." He has been in and out of the system for years, and has seven juvenile felony convictions, all theft-related. He has been on probation and spent time in juvenile hall, at the juvenile camp, and at the California Youth Authority. He was most recently charged with auto theft and residential burglary. Because of his repetitive criminal behavior, the fact that he was less than two months short of being 18, and the fact that he re-offended while on parole from the California Youth Authority, prosecutors sought to have Marquese tried in adult court for his latest offenses. At his fitness hearing, one of his probation officers described him as a "career criminal," who despite receiving multiple rehabilitative services over the years continues to break the law as soon as he is released from detention. Defense Attorney Gilda Valeros disagrees. She sees him as exactly the sort of kid that the juvenile system could help, primarily because of his personality. He is still very young emotionally, she says, and very dependent on adults for guidance and approval. He is very bright, and has does well when he is in an institutional setting: he does not cause trouble, does his school work, and does not participate in gang activities. He reoffends when he is released, she believes, because he is not given adequate support and supervision. She speculated that, in fact, he may unconsciously be trying to get caught in order to be brought back into the system, which is the safest place he has known. She said, "It's a very profound thing when you have such a young man not really seeing anything in either his immediate family or his community that he can become invested in, legitimately and productively and legally. . . . Unfortunately, the most stable environments he ever had were in institutions." Marquese's mother has serious substance abuse problems, and some of Marquese's younger siblings had been temporarily removed from her care by the state. 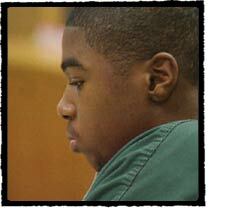 (By the time this happened, Marquese was already in the juvenile justice system, serving time in facilities.) She was in and out of jail during his childhood, and says that she taught Marquese to steal when he was young. She told FRONTLINE that her drugs of choice were heroin and crack cocaine. At the fitness hearing, a probation officer described their home as "a crack house." Despite all this, Marquese loves his mother very much and is very protective of her. At one point, Marquese was paroled from CYA to the custody of his aunt. She was a young woman in her twenties and had also served time in the CYA - for murder. At the fitness hearing, Valeros argued that this and other placements were indicative of how the system had failed Marquese over and over. Because he did so well and was so cooperative with authorities while institutionalized, she believes he repeatedly fell through the cracks and did not receive the assistance he needed to reenter society in a productive way. Prosecutors disagreed vehemently with her characterization of Marquese, claiming that his repeat offending indicated that he was obviously not going to be rehabilitated by yet another stint in the juvenile system. His fitness hearing dragged on over a span of one month, one of the longest running fitness hearings that anyone involved could remember. Judge Nancy Hoffman eventually determined that Marquese should get one more chance at rehabilitation in the juvenile system. Since he was charged with a nonviolent felony, in order to be transferred to the adult system, Judge Hoffman could not find him unfit based on just one criterion. She could only send him to adult court if she found him unfit overall, weighing all the criteria set out by California law: the level of the offender's criminal sophistication, whether the minor can be rehabilitated within the time the juvenile system has jurisdiction over him or her, previous delinquent history, the success of prior attempts at rehabilitation, and, finally, the seriousness of the crime. Hoffman found that he was unfit under the first criterion of criminal sophistication, since he had planned the burglary. She also found him unfit in terms of his prior record of rehabilitation within the juvenile system, since he had reoffended so often after treatment. However, she found him fit under the remaining three criteria. In terms of his prior history she found that his criminal history was mitigated by his "horrendous childhood" during which he received "little or no guidance," and was therefore fit under that criterion. On the fifth criteria, the gravity of the offense, she found him fit. Therefore, Judge Hoffman ruled that he was still amenable to treatment within the juvenile system. 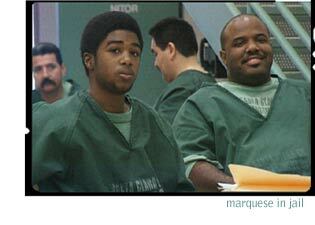 Marquese was returned to the California Youth Authority and will be up for parole in the fall of 2001.